Heat oven to 400°F. Line 13 x 9-inch pan with cooking parchment paper, or spray with cooking spray. In medium bowl, mix crust ingredients. Use a greased spatula or your fingers to press dough evenly into pan. Bake 12 to 15 minutes or until it just begins to turn golden brown; cool. While crust is cooling, in large bowl, beat cream cheese, 1/2 cup sugar and the vanilla 2 to 3 minutes or until smooth and creamy. In medium bowl, beat whipping cream to stiff peaks. Gently fold whipped cream into cheesecake mixture in 2 additions. 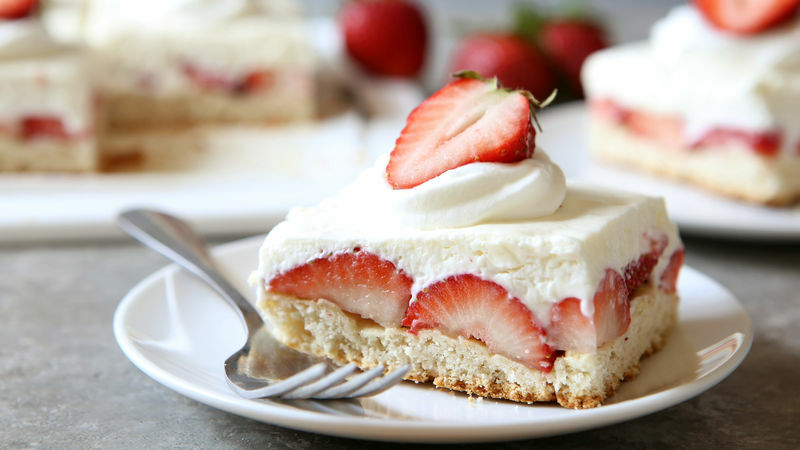 Place sliced strawberries in even layer on top of cooled crust. Spread filling on top. Refrigerate 2 hours before slicing and serving. Top with additional whipped cream and strawberries, if desired. To easily lift chilled bars out of pan for slicing, line pan with cooking parchment paper so there are overhanging sides to use as handles. For clean slices, run knife under hot water, and dry with clean towel. Repeat as necessary.